Happy Friday! I try to save paper doll pieces that I really like for the end of the week. I think of them as a fun treat. But seriously for a second, I think sometimes there is a lot to be said for embracing absurdity. And since I embraced absurdity with this set, I will not apologize for giving her boots high heels. 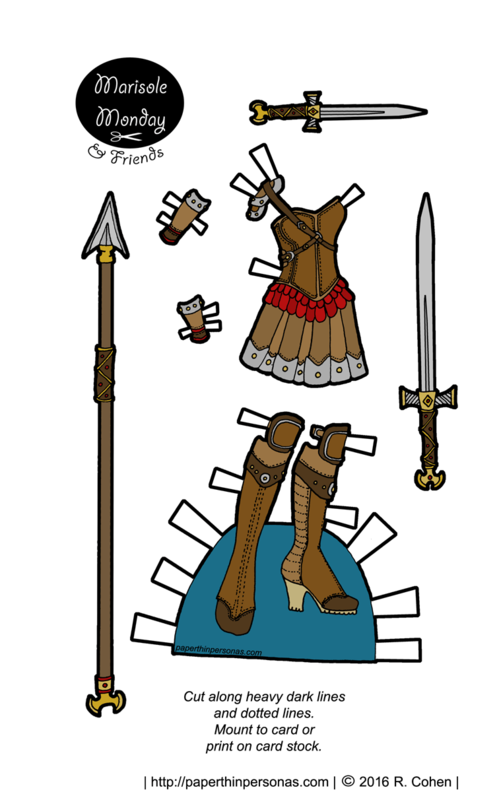 Along with the armor and boots, she has fun weapons- a pair of swords and a spear. I actually had fun trying to make them all match in design motifs. These are the thing I think about when designing paper dolls. So, my dear readers, should fantasy armor be practical or absurd? Let me know what you think in a comment. As always, if you want to donate and become a patron to support PTP, there fun perks like a Behind the Scenes blog, extra content, and previews. Need a Marisole Monday & Friends Paper Doll to wear today’s outfit? Pick One Out Here. Thank you! There is more absurd armor in the works, though some practical full plate should go up in a few weeks, I think. This feels very Roman to me, so maybe it isn’t totally absurd. Love the boots and your amazing knack for creating shoes! Well, you know I love me some shoes. Yeah, there’s definitely a roman-thing going on with this armor. i love it!!! aside from the shoes it’s not actually that absurd given the shin guards. the neck and the arms are where it pushes “absurd”.